Remember the Mini Mary-Janes? 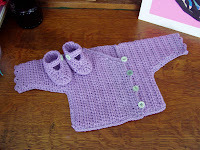 Here’s a baby jacket I designed to go with them. I started off with the same yarn as the booties, but it soon became evident I was not going to have quite enough yarn for the whole jacket. Searching my stash, I found another terrific cotton yarn, same color, but different texture. This became the panel on the front edge of the jacket as well as the edge of one sleeve. None of my green buttons matched, so I just jumbled them up and it looks as if it was meant to be like that. I have had this finished for some time now and keep telling myself I’ll write up the pattern to share with others but I go on to the next project and have a hard time making myself slow down enough to write out patterns. Oh well, it may just have to be a one-of-a-kind gift for one of the new babies in our family. I really ought to put it on somebody’s baby to see how it fits…I’m guessing it’s a 0-3months jacket and booties. I so enjoy the process of “making up” something as you go and then “making do” with what you have. It’s so much fun reading your blog and looking at your pictures. As usual, I’m always inspired by your art and want to find my own artistic niche! Thanks for the inspiration!